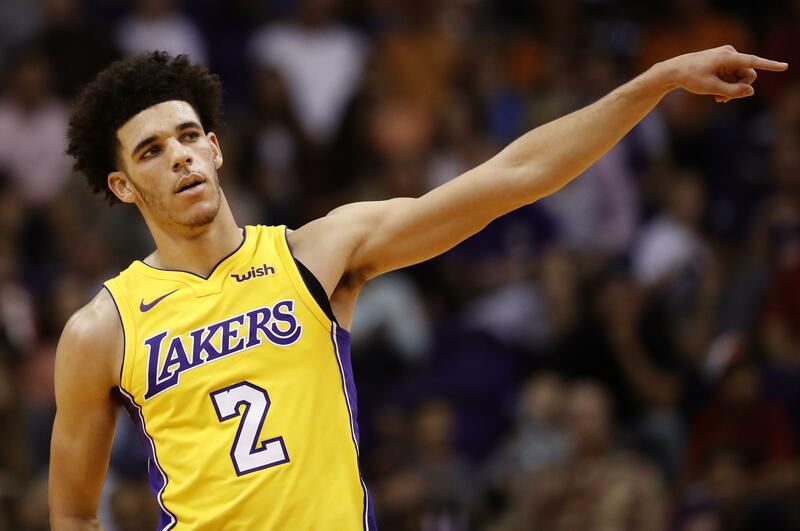 Fri., Oct. 20, 2017, 11:44 p.m.
Lonzo Ball barely missed a triple-double with 29 points, 11 rebounds and nine assists in his second NBA game and the Los Angeles Lakers held on to beat the Phoenix Suns 132-130 on Friday night in Phoenix. The Suns had a chance to tie it with 1.2 seconds to play, but T.J. Warren missed the first of two free throws. That meant he had to miss the second intentionally and hope for a rebound, but the Suns couldn’t get a decent shot off before the buzzer. Ball, the No. 2 overall pick this year who is a week shy of his 20th birthday, took over down the stretch, scoring eight points in a 2 1/2-minute span. His final basket during that run, a floating layup, put Los Angeles ahead 130-122 with 1:35 to play. But the Suns came roaring back behind Eric Bledsoe and Devin Booker, whose 3-pointer with 6.4 seconds left cut it to 131-130. Brandon Ingram made one of two free throws to give Phoenix one last chance and Warren was fouled by Ingram on an inbounds play. The free throw was off the back of the rim, though, and the Lakers survived. Bledsoe scored 29 points, 17 in the fourth quarter. Booker also flirted with what would have been his first career triple-double, finishing with 25 points, 11 rebounds and eight assists. Warren added 24 points, 17 in the second quarter. Ingram scored 25 points for Los Angeles. Both teams were coming off of season-opening blowout losses. The Lakers lost to the Los Angeles Clippers 108-92, and Phoenix was routed by Portland 124-79, the most one-sided loss in Suns history and most one-sided season opener ever in the NBA. Warriors 128, Pelicans 120: In New Orleans, Klay Thomspon scored 31 points, Stephen Curry added 28 and Golden State easily erased a 15-point first-half deficit to beat New Orleans. Kevin Durant added 22 points for the Warriors, who won for the first time this young season after dropping their opener to Houston. New Orleans is still looking for its first victory after two games, shooting well early in both games before fading in the second half. Anthony Davis had 35 points and 17 rebounds for the Pelicans, while fellow big man DeMarcus Cousins also had 35 points. After trailing by double digits much of the fourth quarter, the Pelicans pulled as close as five points down on Cousins’ 3 with about three minutes to go. But Thompson responded immediately with a 3, and Golden State remained comfortably in control from there. Cavaliers 116, Bucks 97: In Milwaukee, LeBron James had 24 points and eight assists, Kyle Korver hit three straight 3s in a big third-quarter run and Cleveland beat Milwaukee. Kevin Love added 17 points and 12 rebounds for the Cavs. Their 15-5 spurt over the final 4:25 of the third quarter, sparked by Korver’s long-range shooting, opened a 13-point lead. Cleveland led by double digits most of the rest of the way to spoil the Bucks’ home opener. The defending Eastern Conference champions started the season with a second straight victory over an East contender after beating the Boston Celtics in their home opener. Korver finished with 17 points and was 5 of 6 from 3-point territory. Milwaukee’s Giannis Antetokounmpo had 34 points on 15-of-22 shooting, along with eight rebounds and eight assists. Malcolm Brogdon had 16 points. Celtics 102, 76ers 92: In Philadelphia, Kyrie Irving scored 21 points, Al Horford had 15 and Boston won for the first time since losing Gordon Hayward, topping Philadelphia. The Celtics lost their first two games after Hayward went down in the opener with a mangled ankle that may cost him the season. Jayson Tatum scored 15 points and had Terry Rozier III had 14 to keep the Celtics afloat with a makeshift lineup. Joel Embiid knows the feeling of missing an entire season. The Sixers center missed his first two NBA seasons with foot injuries and was limited to 31 games last year. Healthy and ready to play, Embiid had one of his worst games as a pro, with 11 points on 4-for-11 shooting. He missed all six 3s in 28 minutes. J.J. Redick led the Sixers with 19 points. Timberwolves 100, Jazz 97: In Minneapolis, Jamal Crawford scored all 17 of his points in the fourth quarter and hit a 3-pointer with 27.5 seconds to go that helped Minnesota hold off Utah in its home opener. Andrew Wiggins had 21 points, and Karl-Anthony Towns added 20 points and 10 rebounds for the Timberwolves in their first victory of the season. The Wolves led by 10 with five minutes to go before former point guard Ricky Rubio rallied the Jazz. But Crawford buried a 3 from the corner, his third in the period from beyond the arc, to clinch the win. Rubio had 19 points, 10 assists and five rebounds in his first game back in Minnesota. Rodney Hood scored 20 points before leaving with a left ankle injury, Derrick Favors scored 16 points and Rudy Gobert had 10 points and 12 rebounds for the Jazz. Rubio spent his first six seasons in Minnesota before being traded to Utah in July. Nets 126, Magic 121: In New York, D’Angelo Russell, Trevor Booker and DeMarre Carroll all scored 17 points and Brooklyn beat Orlando in its home opener. Booker added 11 rebounds and made the clinching free throws with 0.9 seconds left after Orlando’s Evan Fournier missed a tying 3-point attempt. The Nets bounced back after yielding 140 points Wednesday night in a season-opening loss to Indiana, a game in which they lost Jeremy Lin for the season after a ruptured patella tendon in his right knee. Nikola Vucevic scored a career-high 41 points and grabbed 12 rebounds for the Magic. Justine Skye took a knee at the end of her national anthem performance. Skye, who is black, was nearing the completion of the song when she went to one knee for the finish. A Nets spokeswoman said the team was not aware of Skye’s plans. Hornets 109, Hawks 91: In Charlotte, North Carolina, Kemba Walker scored 26 points, Dwight Howard had 20 points and 15 rebounds in his first home game with Charlotte, and the Hornets rallied to beat Atlanta. The Hornets trailed by as many as 20 in the first half, but used a 24-0 run in the third quarter to blow open the game and win their home opener. Howard, who played last season for his hometown Hawks before being traded away, was unstoppable on the block. Dennis Schroder had 25 points for the Hawks. Trail Blazers 114, Pacers 96: In Indianapolis, CJ McCollum scored 28 points on 12-of-18 shooting to lead Portland past Indiana. With Pacers starting center Myles Turner out with a concussion, McCollum teamed with backcourt mate Damian Lillard to take advantage of an inexperienced Pacers interior defense. Lillard scored 11 of his 18 points in the first quarter, and the Blazers led 62-52 at halftime. McCollum picked it up in the second half, scoring Portland’s final 12 points of the third quarter and giving the Blazers a 91-73 lead. T.J. Leaf and Victor Oladipo scored 17 points apiece for the Pacers. Wizards 115, Pistons 111: In Washington, John Wall scored 20 of his 27 points in the second half and added 10 assists to help Washington beat Detroit. Otto Porter led the Wizards with 28 points, and Bradley Beal added 24. Washington won despite blowing a 15-point fourth-quarter lead. Reggie Jackson scored 21 points for Detroit. Kings 93, Mavericks 88: In Dallas, George Hill scored 21 points and Sacramento beat Dallas for its first victory of the season. Buddy Hield and Zach Randolph each had 13 points, and rookie point guard De’Aaron Fox added nine points and 10 assists as the Kings bounced back from an opening loss to Houston. Harrison Barnes scored 24 points, 16 in the fourth quarter, as Dallas lost back-to-back games to begin the season. Published: Oct. 20, 2017, 11:44 p.m.